Since Friday was Labor Day in France, my market was full and doing brisk business. On Fridays it is usually just a little cluster of the regular stands. "This is my mother," I said to my market peeps, as Mama nodded and diligently focused in on baskets of this and that, cropping close with her new camera set on "flower setting". They all responded "Yes, I see that." Lyon is a city that gets goodness fresh from many directions, and on Friday, I saw that the ladies coming up from Provence have begun selling what in France we call the Calice artichoke. Calice translates in English to calyx, and in Italian to wineglass, you choose. Perhaps the gardeners will chime in and tell me what this young artichoke is generally called in English. These are the first cuttings from the plant, young underdeveloped artichokes. 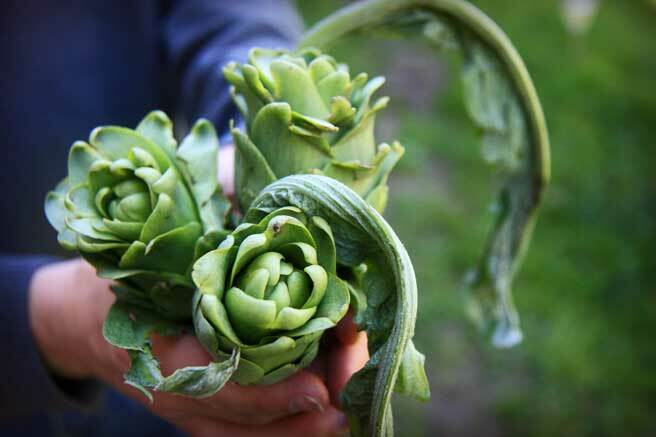 They are removed from the plant early in the season to allow the plant the resources to render more healthy artichokes later on, having fewer blossoms to nourish. Calice artichokes' market season endures only the blink of an eye. Hesitate, and you might miss them. I asked my friend Judy Witts Francini about them, and she told me that in Italy, this petite tender spring vegetable's short market season creates a buying frenzy because they are very popular for pickling and preserving in oil. She recommended a recipe from her cookbook, which I plan to prepare for dinner guests at the country house this weekend. In the meantime, I simply steamed my first batch and we enjoyed them cradled in a bowl with other goodies as a warm composed spring salad. They are beautiful! Much more flowery and romantic than standard artichokes, I think! It's possible I may have already missed baby artichokes at USGM. The ones you see elsewhere are globes, which while have a lusciousness all their own, just don't compare to the tiny ones. Hello you three! Thank you for coming by. Keep an eye out, you never know when you might stumble on them. Market peeps. Ha ha ha, you're funny. I hope you had a wonderful visit with your mother. Good luck in your future of jarring artichokes; I love marinated artichokes, mmm. I hope to grow artichokes this year. I will look forward to these, and I learned something from this. Thank you. These are beautiful~I missed seeing these in the markets while visiting FR. Will keep my eyes opened next spring!